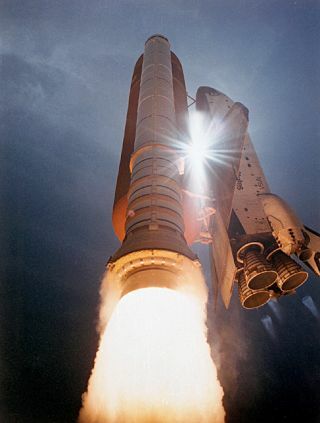 A space shuttle launches into space from NASA's Kennedy Space Center in Florida. Four veteran space writers were honored with journalism awards this month to mark their contributions to public understanding of space. Freelance writer Leonard David was given The National Space Club Press Award for "significant contributions to public knowledge and understanding of astronautics and its impact upon our nation and all humankind." The award was presented at the 54th Annual Robert H. Goddard Memorial Dinner in Washington, D.C. on April 1. David, SPACE.com's space insider columnist, has been writing about the space industry for more than four decades. He is a past editor-in-chief of the National Space Society's Ad Astra and Space World magazines, and his articles have appeared in the Financial Times, Foreign Policy magazine, Private Air, Sky and Telescope and other publications. David has also been previously honored with the National Space Society's Space Pioneer Award for Media and the Orbit award for Space Media from the Space Tourism Society. This week, on April 11, the Space Foundation also presented its annual space journalism prize: the Douglas S. Morrow Public Outreach Award. The 2011 Morrow award was split between three recipients: Jay Barbree, of NBC News, Marcia Dunn, of the Associated Press, and William Harwood, of CBS News. Each of these writers has been covering the space beat for decades. "The 2011 recipients have been at the forefront of space news coverage -- via television, print publications and online -- and through their commentary have helped the nation understand complex scientific information, deal with national tragedy and experience the triumph of discovery and accomplishment," the Space Foundation said in a statement. The Morrow award was presented April 11 at the 27th National Space Symposium in Colorado Springs, Colo.
Barbree was the first journalist to report on the cause of the Challenger shuttle accident, and was among the first to break the news of NASA concerns about foam striking the shuttle Columbia's left wing during launch – the incident that led to the Columbia accident in 2003, the Space Foundation said. Barbree has written eight books, including two memoirs co-authored with astronauts Alan Shepard and Deke Slayton. Marcia Dunn has been covering NASA and spaceflight since 1990 for the Associated Press news wire. After NASA flies its last two shuttle missions this year, Dunn will have written about 99 space shuttle flights. Dunn was among the first group of U.S. journalists allowed into Kazakhstan's Baikonur Cosmodrome to cover a manned Russian Soyuz launch in 1995. She is also the recipient of the Associated Press Managing Editors' top deadline reporting prize, which she won in 2003 for her coverage of the Columbia shuttle disaster. Harwood has been covering space – both spaceflight and astronomy – for more than 27 years. In addition to serving as CBS News Space Consultant, Harwood often contributes to CNET, Spaceflight Now and The New York Times. He also manages the CBS News:space blog. Harwood is also the co-author, with Michael Cabbage, of the noted book on the Columbia accident, "Comm Check...: The Final Flight of Shuttle Columbia."